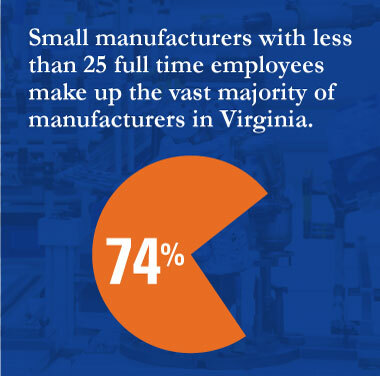 74% of Virginia’s manufacturers have less than 25 employees. Small manufacturers feel the pressure of a hyper-competitive global market with increasing operating costs due to advanced technology needs, the challenges of maintaining a skilled workforce, supply-chain management, growing government regulations that unfairly burden small businesses, and more. The Virginia Manufacturers Association (VMA) is a non-government trade association exclusively serving Virginia’s manufacturers for over 94 years. Because our goal is to serve all manufacturers regardless of size, the VMA has created a Small Manufacturers Membership Program opportunity that will give you maximum value for your investment. What is the industry saying about Small Manufacturers? An interview about the power of small manufacturers with NAM President and CEO Jay Timmons. Together we’re better! Put the power of the VMA to work for your small business. Becoming a member of the VMA instantly expands your company to include a team of employees who are committed to your success and the future of manufacturing in Virginia. The Small Manufacturers rate is based on number of employees (0-25 Employees – $263). An experienced full-time Government Affairs Staff who work to ensure that industry’s legislative and regulatory interests are addressed in a professional and responsible way throughout the year. Free Advocate Membership in the National Association of Manufacturers (NAM) for VMA members with 25 or fewer FTEs or less than $5 million revenue, headquartered in the Commonwealth of Virginia, and not currently a member of NAM. NAM Advocate Members will receive Capital Briefing, Monday Economic Reports, Member Focus Magazine, Manufacturing Economy Daily, invitations to the Executive Insight Series, invitations to the Manufacturing Summit and Congressional Award Events, and listing in NAM’s Friends of Manufacturing campaign (see VMA staff for details). You now have two partners working for you! International trade assistance grants in cooperation with the VITAL program. Services include market research, finding a local partner, legal/shipping/payment issues, international trade shows and trade missions. Access to our Service Provider and Contractor Directory. Exclusive member discounts representing savings or free services for your company and your employees. Access to the VMA Monthly Webinar Series and Events to help you stay engaged. Involvement in a VMA committee which is the best avenue to directly affect change, get involved and stay informed. A complete range of insurance service member benefits, including unique flexibility and creativity in designing affordable, custom-tailored, and competitive insurance programs for our members. Premier VMA events offers our members professional development and networking opportunities throughout the year. Members enjoy discounts on attending and exhibiting at all VMA events. The Manufacturing Skills Institute (MSI) provides relevant education and skills training for careers in advanced manufacturing by offering world-class training programs delivered by MSI and MSI education partner institutions. The bottom-line is that the VMA can help you be more competitive and ensure that manufacturing grows in Virginia’s economy.